In 1928, the Auto Cycle Council of Australia (ACCA) was formed to represent the interests of motorcycle clubs and state associations at a national level. 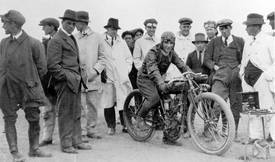 The ACCA would eventually become Motorcycling Australia, the representative body for motorcycle racing in this country. But organised motorcycle sport was established many years before the ACCA. Speedway racing was the first form of competition to be organised in a professional manner. The late John Hoskins was credited with presenting speedway to the world, when he conducted his first meetings at the West Maitland Showgrounds (NSW) in 1923. His efforts laid the foundation for future Australian successes in the world championship. National conferences were biennial affairs until 1972, before becoming annual from 1973. Delegates from each State Controlling Body (SCB) participated at the conferences. These high-level gatherings had the primary purpose of updating the General Competition Rules (GCRs) and determining future directions of the sport. In 1975, the then ACCA moved into the international sphere by affiliating with the Federation Internationale de Motocyclisme (FIM). By the 1980s, sport was no longer an amateur business and it was unfeasible to operate in the traditional way. In 1989, the ACCA established a permanent office in Melbourne, staffed by a full-time administrator and assistant. By 1991, a new full-time National Executive Director was appointed, replacing the administrator. It was clear that the organisation had to change with the times and provide the professionalism demanded by modern sport. Subsequently, in late 1992, the name “Motorcycling Australia” replaced ACCA, to reflect a more modern and progressive image, and to ensure easy identification with motorcycling sport. A new logo was introduced at the same time, to match the improved image. By the 1980s, sport was no longer an amateur business and it was unfeasible to operate in the traditional way. A full-time National Development Officer was appointed in early 1993, reflecting the growth of the sport and the organisation’s commitment to support and encourage that growth. At the 1993 annual conference, there was an overwhelming vote in favour of change for the long-term benefit of the sport, including plans for restructuring the organisation. The following year, at the annual conference, the council approved a restructuring of the organisation. National commissions were established and commissioners appointed for each branch of the sport. Each three-person commission was responsible for rule changes and the national development of its discipline. Special sub-committees, responsible for the business aspect of the sport, were also established. In 1998, the Northern Territory was formally admitted as a member. At the 2000 annual conference in Hobart, a new constitution was adopted which empowered the independent board of directors. Councillors were reduced to one from each state. In the same year a Motorsport Manager was appointed to administer Australian championships. That role would eventually become that of Sport and Development Manager, merging the duties of National Development Officer and Motorsport Manager into one role. In 2001, Motorcycling Australia appointed a Media Manager and in late 2002, a new role of General Manager was created, replacing that of Operations Manager. Today, the organisation has in excess of 32,700 competitors, more than 350 affiliated clubs, and over 3000 registered officials. Motorcycling Australia will continue to serve its members and the motorcycle sport community, to ensure the healthy future of motorcycle sport.